We caught up with Matt Gilroy, Team USA defenseman, after practice on Tuesday in Cologne, Germany, to get his thoughts on a number of topics. 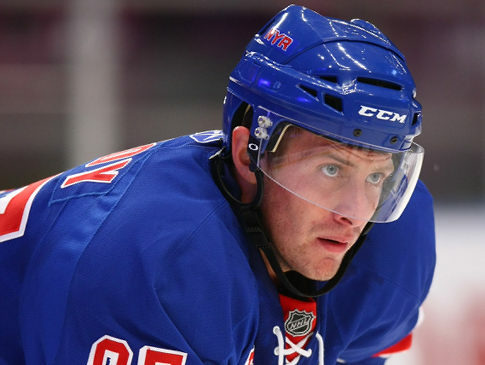 Gilroy is in his first season with the NHL’s New York Rangers and is playing in his first-ever IIHF World Championship at any level. He played forward growing up as a kid, but when he walked on to play hockey at Boston University, he converted to defense. Gilroy helped BU win the NCAA title in 2009 and also won the Hobey Baker Award as the top college hockey player in the country that year. Q: This is your first experience at the World Championship. How has it been? A: It’s been good. It’s a different kind of hockey. The fans are a lot different. They have so much passion. I don’t understand a word they’re saying, but it’s a cool atmosphere to be a part of. The game we played in Gelsenkirchen that set the world attendance record was like no other game I’ll probably ever play in again. The party outside before the game was really something. Inside the stadium, everyone was booing us, but it was a pretty special feeling being out there in front of almost 80,000 people. Q: What is your favorite memory growing up as a youth hockey player? A: Probably playing mites with my brothers Frank and Timmy for the Nassau County (N.Y.) Lions. We played on a line together and that’s the only time we’ve played on a line together since. Q: Is there a youth hockey coach that made a difference in your life? A: Aleksey Kikiforov trained me since I was 10 years old. He also trained Mike Komisarek, Chris Higgins and Eric Nystrom. He taught us to be hockey players, not just positional players. We learned the fundamentals of the game so well. I credit him for all my success in hockey. Q: Describe how you felt when you found out you won the Hobey Baker Award? A: I found out on the ice. I really had no idea. It was kind of crazy. I was getting ready for the biggest game of my life the next night and here I was at an awards ceremony with my teammates and a lot of fans. It was obviously a real nice award to receive. Q: And then the next night you won the national title in improbable fashion. How did that feel? A: That was the best. I still don’t understand how it happened. That game was one of my favorite memories ever. My whole family was there. To win a national championship is a hard thing to do and when you’re able to do it, it’s an unbelievable feeling. Q: You played cross-ice hockey today in practice. How does that help you as a player? A: It helps a lot. You’ve got to think and react more quickly in cross-ice. Cross-ice is more of a skill game and that helps a lot when you get into a real game situation. Q: What do you do away from the rink? A: I really enjoying hanging out with my family. I have a huge family … I’m one of 10 kids. I like the beach. We live on the beach in Point Lookout, Long Island. I love the TV show Family Guy and my favorite movie is Caddyshack. I played lacrosse growing up my whole life through high school and enjoy that. I like college football (Notre Dame) and college basketball (Duke) too.